Used car buying can be a daunting and stressful process. Not with this dealership. They were friendly, knowledgeable and helpful. So appreciated our sales rep and the experience we had in buying a car. John M was very easy to work with and kept me up to date with helpful texts. Avery is Awesome! We love her honesty, openest, kind hearted, insightful knowledge about the cars, and services Nissan offers. What she didn’t know off hand, she quickly found out by her team, which showed us they have great teamwork! Wonderful people! Avery, made and is making sure our every need is met with assurance. This was my first car purchase and my expectations are high. Everyone was nice, helpful patient and understanding of me being cautious. Thank you Avery! You ROCK! And thank you Nissan for putting together a wonderful team who cares! Janie G.
Amazing staff and service! Would recommend to anyone looking for a Nissan in the West Metro! The Walser Way is the only way I buy Cars!!! Brandon was very responsive to my questions and requests, and very patient with me. No pressure! He found me the right vehicle at the right price! 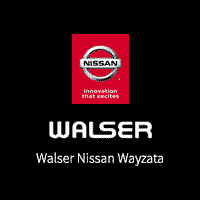 Walser Nissan Wayzata draws in customers new and old the natural way: with top-quality automobiles, a sales experience focused squarely on the customer’s needs, and a little ol’-fashioned common sense.